Living in a new house, we have about a hundred projects we plan to get going on real quick. We purposely bought a house that was move in ready yet also had the capacity for us to renovate a bit and put our own touches on it. This house has plenty of opportunity for that. 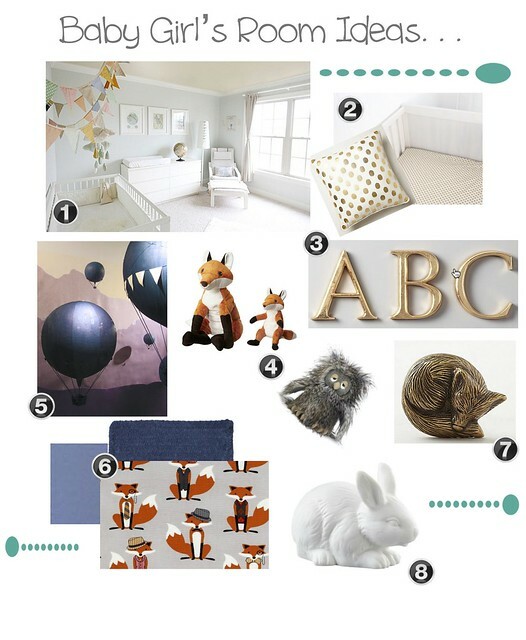 Our first project though was a pretty obvious one with a ticking clock – planning out the baby’s room! With so many decorating possibilities, it was a challenge to narrow down exactly what sort of aesthetic I was going for. Even though we know that we are having a baby girl, I was not too amped on having a girly pink princess room, as fun as that can be. For the past year I have been into white and that is not changing anytime soon. I decided that would need to be my canvas and I would throw in colour with accents. With a few pieces that I knew I would be using for sure, my ideas are starting to take form and blend together. I would absolutely LOVE to hear your thoughts! 1.) As I mentioned, I am obsessed with different shades of white. I love how this room is so soft and subtle with shades of white, and has delicate accents of colour here & there. 3.) Monogram obsession alert! I believe this comes from my job as well. I am constantly surrounded by extremely cool forms of monogram. We have zinc letters at the store which would be perfect however as you can tell, gold is my accent. I picked up some basic wooden letters at the Walmart in Bellingham last week and intend to spray paint them gold. Easy little DIY project which will cost me about twenty dollars when all is said and done. They will be custom made for baby girl’s little room and won’t cost me an arm and a leg. Win! I will be spelling her name on the wall up above her crib – and yes we have a name! Mum’s the word till she arrives though. 4.) I swear, most of time when I am finding cute stuffed animals for her room, I secretly want them for myself. They have come such a long way since I was a little girl. So cute and quirky now! I am sticking with a woodland creature theme – foxes, owls, bears, deers….. you get the idea. 5.) So back to Anthro….. if you are an Anthropologie lover, you know that we create everything in our window displays. Earlier in the year, we created this fantastic window display of hot air balloons. It took the team ages to paper mach and paint them all but they turned out really beautiful. My district manager was kind enough to let me have three! The rest were donated and auctioned off – trust me these balloons are really cool! I have three that are different sizes and I am going to hang them in the corner of the room near the window at different heights. It will look so precious! I may tie this idea into a mobile above the crib too but right now I am undecided. 6.) Oh prints and patterns, how I love thee! Mommas-to-be, question for you. Do you ever find yourself in a store, staring endlessly at options, and forget completely what you are looking for? Baby brain at it’s finest! I was in the fabric store for nearly two hours the other day and left feeling very overwhelmed and empty handed. There is just so much variety in fabric and so many directions you could go. I think I am going to stick to a couple shades of blue and some cute fox prints. This idea has room to grow but it’s a starting point for now. Baby girl will just learn to love blue! 7.) These are one of my favourites! Oh and what do you know; they are from Anthro! I bought these brassy sleeping fox knobs ages ago, once again knowing that they would be perfect fur the nursery. A buddy of ours gave us a beat up dresser when he moved and we decided to refinish it. The dresser is perfect height for a baby’s change table. So with some sanding and a fresh coat of a slightly off shade of white, the dresser was ready for knobs. We gutted the centre drawers, turning them into cubbies. I filled them with rustic baskets. The whole combination looks absolutely stunning and really showed me how you can transform an old piece of furniture into something AWESOME! It’s my favourite piece of furniture in this house now. 8.) Lastly, what nursery doesn’t have a ceramic white bunny! Thank you Anthropologie again …..
Stay tuned for updates on the nursery as it all comes to life!